It's Always About Jerry West, But It's Not What Everyone Knows! The Story Behind the Photo That Inspired the NBA Logo! In the late 1960s, the NBA was facing fierce competition from a recently-founded rival known as the ABA (American Basketball Association). As history would show, Americans at the time didn’t seem to have the space in their fandom for more than one premier professional sports league for each sport. Part of the burden to make sure that the NBA won the war was given to Alan Siegel, founder of the branding company Siegel + Gale, who was entrusted with the task of creating a logo that made it clear to everyone that there was no possibility, the NBA was the true and only American league of professional basketball. Before creating the new logo, Alan Siegel comb through all sports magazines and wrote about basketball to look for inspiration, but nothing. He could not figure out which direction to take. 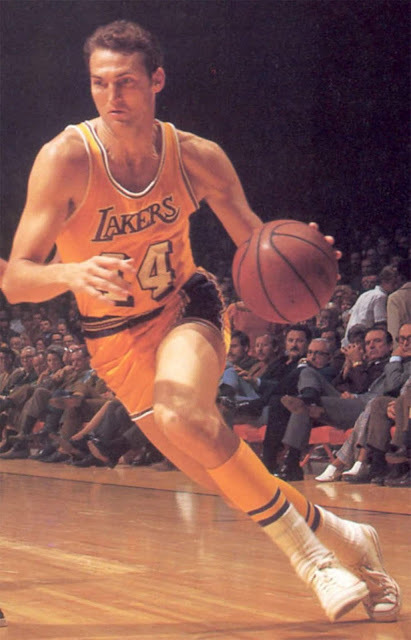 But then a photo of the Los Angeles Lakers superstar, Jerry West, came into his hands. It was 1969. The actual original photo that the NBA logo is based on. From this photo Siegel created an unmistakable white silhouette on a red and blue background that is the logo that we all still associate with the most famous league in the world. It has always been believed that the image that inspired Siegel was what you see here on but a thread on reddit/NBA has revealed that it is so. The magazine that came to be in Alan's hands was an edition of Sports Review dedicated to basketball where on the cover there is Jerry West exactly in the position depicted in the NBA logo. Obviously the NBA has never officially declared that the logo depicts Jerry West, why? You will say. Easy, if the National Basketball Association did so, it should recognize Mr. West billions of billions for all the revenue that the league has earned, from 1969 onwards, "unduly exploiting" the image of one of the greatest players of all time.